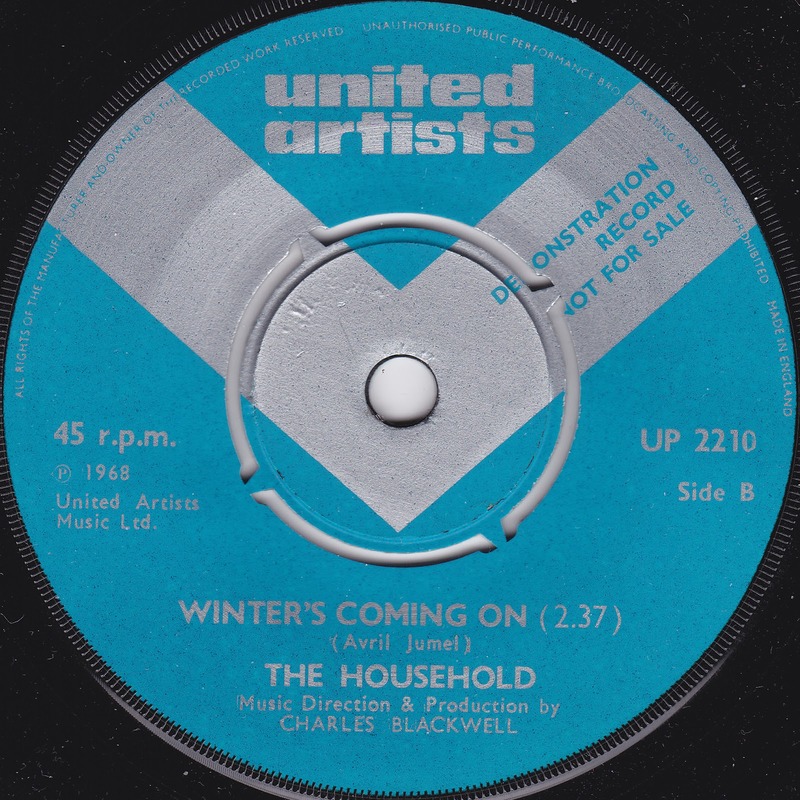 Folksy harmony pop from Blackpool which sounds particularly beautiful on the wintery flipside. Another one of those records dealers everywhere are prone to telling fibs about. Oft labelled as a "psychedelic rarity", this actually sits more in folk/ sunshine pop territory, straddling the divide between the Mamas and the Papas and rather more rootsy music. "21st Summer" is a cute, rustic little tune which has been enjoyed by a few sixties aficionados over the years, but doesn't sound like a hit single at all, which would go a long way towards explaining why it wasn't one. The B-side "Winter's Coming On", on the other hand, is a lot busier and sprightlier and also more appropriate to the present time of year (unless you're reading this in the Southern hemisphere). It has the same combination of pleasingly tight vocal harmonies and kick and bounce of a lot of the best folk-rock of the period, and deserves a bit more attention than it's actually had. 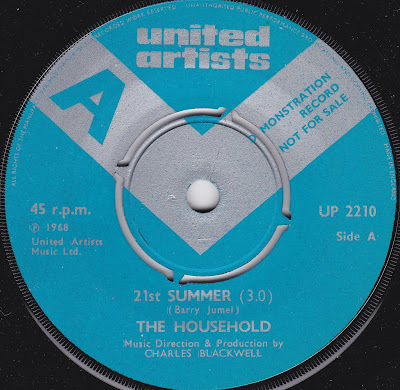 As for The Household, they're something of an enigma - there's very little information available about them, although apparently they were one of the first acts United Artists picked for their new release schedule as a fully fledged "proper" label in Britain (rather than a subsidiary) so clearly somebody in the organisation had high hopes for them. [Update - since this blog entry was originally posted in January 2012, we've established that The Household were from Backpool*, were previously known as Friday's Mind, and were a family group consisting of brothers Barry, Terry and Wayne Brumel and sister Avril Jumel (who can clearly be heard at the forefront of this record). They apparently also appeared on "Opportunity Knocks", though I can't establish which name they performed under. Their debut single on United Artists "Guess I'll Learn How To Fly", a cover of the Fifth Dimension song, picked up radio play but didn't chart. This, on the other hand, failed on the airplay front as well and the group presumably parted company with United Artists not long afterwards. That's literally all I know, so if there are any further gaps to plug, such as where the members all are now, I'd be curious to hear them]. Thank you so David !!! My two penn'orth. I prefer the b-side which might have stood a better chance over the a-side - which seems a bit 'rapey' even for the '60s?